The excavations led by Margaret and Tom Jones on the Thames gravel terraces at Mucking, Essex, undertaken between 1965 and 1978 are legendary. The largest area excavation ever undertaken in the British Isles, involving around 5000 participants, recorded around 44,000 archaeological features dating from the Beaker to Anglo-Saxon periods and recovered something in the region of 1.7 million finds of Mesolithic to post-medieval date. While various publications have emerged over the intervening years, the death of both directors, insufficient funding, many organisational complications and the sheer volume of material evidence have severely delayed full publication of this extraordinary palimpsest landscape. Lives in Land is the first of two major volumes which bring together all the evidence from Mucking, presenting both the detail of many important structures and assemblages and a comprehensive synthesis of landscape development through the ages: settlement histories, changing land-use, death and burial, industry and craft activities. The long time-gap since completion of the excavations has allowed the authors the unprecedented opportunity to stand back from the density of site data and place the vast sum of Mucking evidence in the wider context of the archaeology of southern England throughout the major periods of occupation and activity. 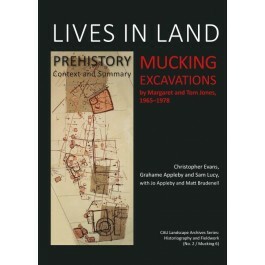 Lives in Land begins with a thorough evaluation of the methods, philosophy and archival status of the Mucking project against the organisational and funding background of its time, and discusses its fascinating and complex history through a period of fundamental change in archaeological practice, legislation, finance, research priorities and theoretical paradigms in British Archaeology. Subsequent chapters deal with the prehistoric landscape, each focusing on the major themes that emerge by major period from analysis and synthesis of the data. The authors draw on archival material including site notebooks and personal accounts from key participants to provide a detailed but lively account of this iconic landscape investigation. "Essential reading for archaeologists concerned with British Prehistory." "This present volume is a celebration in many ways of not just the site itself and its important sets of material and finds but also of the way we arrived where we have today in terms of how we view landscape archaeology and how we now excavate whilst looking beyond the edges of the trenches."